I am thankful to finally have a Christmas album! 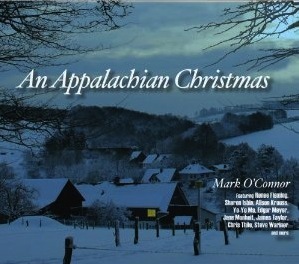 I am thrilled to release An Appalachian Christmas CD this holiday season. This completes my trilogy of the "Appalachia" recordings: Appalachia Waltz, Appalachian Journey and now a fitting conclusion--An Appalachian Christmas. As is the case with each of these "Appalachia" albums, they have helped me make the musical statement that Appalachia is the original melting pot of our country featuring more diverse styles and traditions of American music than anywhere--blues, spirituals, hoedown, ragtime, bluegrass, jazz... The mountain range extends up into Pennsylvania where I currently have a home on the river. The region even inspired the most well-known American Classical music ever composed, Copland's "Appalachian Spring." This is the spirit of my new holiday album--carols, fiddling, jazz, and a couple orchestrations too. It is inspired by what one could hear in the O'Connor household at Christmas time when I was a child as well. I remember one Christmas where nearly all the presents were record albums of all kinds! So says Mark O’Connor in a statement sent to his email list. Read carefully--this Appalachian Christmas is in “the spirit” of the mountain region he sometimes calls home. It’s important to remember this when considering the delightful orchestrated romp through “Sleigh Ride” (from the 1987 collection, Warner Bros. Records Presents--A Christmas Tradition), which takes on its Appalachian tint when O’Connor enters with his bright, exuberant solo and is followed by a pretty cool banjo romp of the type rarely encountered in an orchestral setting. O’Connor’s plaintive fiddle also lends the pastoral element to the album's lovely opener, “The Christmas Song,” the Yuletide classic courtesy Mel Tormé and Robert Wells, here blessed with a warm, subdued vocal by Jane Monheit, an O’Connor cohort from earlier projects; she returns later on a bopping rendition of “Winter Wonderland” worthy of O’Connor’s Hot Swing Trio, with which Monheit appears on the Trio’s acclaimed In Full Swing album. From deep in the vaults, O’Connor dusts off “Ol’ Blue” from his 1989 On The Mark album, which happens to boast a warm vocal reading by James Taylor over a backwoods backdrop of dobro, percussion and fiddle in an easygoing rendition carrying the slightest edge of poignancy, mostly in O’Connor’s long, sensitive, bowed lines. From Appalachian Journey (also on Beautiful Dreamer--The Songs of Stephen Foster), his acclaimed collaboration with Yo-Yo Ma and Edgar Meyer, O’Connor retrieves a magnificent performance of the gentle, compassionate Stephen Foster lullaby “Slumber My Darling,” sung with plaintive tenderness by Alison Krauss. One of the album’s most dramatic performances, apart from Krauss’s, pairs the gravitas of mezzo-soprano Renée Fleming with O’Connor on a stark rendition of “Amazing Grace,” from her 2005 Sacred Songs album. Fleming has since performed it at ceremonies marking the anniversary of the 9/11 World Trade Center attacks and made it something of a trademark. The deliberate, measured pace the duo adopts allows both to make moving statements in an austere setting, with O’Connor complementing Ms. Fleming’s solemnity with searing, anxious flurries articulating the singer’s deepest yearning for salvation. A reverential, atmospheric “What Child Is This” (from 1991’s second volume of Warner Bros. Presents--A Christmas Tradition), tenderly treated by O’Connor, leads into a powerful take on “Jesu, Joy of Man’s Desiring,” at the outset a swirling small combo arrangement for guitar, percussion and tin whistle before it erupts into a full-blown, jubilant, orchestrated Irish jig with Mannheim Steamroller aspirations. Over Chris Thile’s mandolin glissandos O’Connor fashions ruminative, swaying lines in the melancholy “One Winter’s Night,” a song the fiddle master explored as far back as 1989 with Edgar Meyer, Sam Bush, Jerry Douglas and Bela Fleck when those distinguished players joined forces as Strength in Numbers. The version here is from a live recording of a 2002 performance in Nashville marking O’Connor’s 30-year anniversary as a professional musician, released on the two-CD Thirty-Year Retrospective. “Now It Belongs To You,” a stirring, thoughtful country ballad concerning generational bequeathal of a family fiddle, features a heartfelt Steve Wariner vocal and one of O’Connor’s most affecting country solos on record. As featured on An Appalachian Christmas, the Stephen Foster lullaby tenderly rendered by Alison Krauss in a live performance from the album Appalachian Journey with Mark O’Connor, Yo-Yo Ma (cello) and Edgar Meyer (double bass). 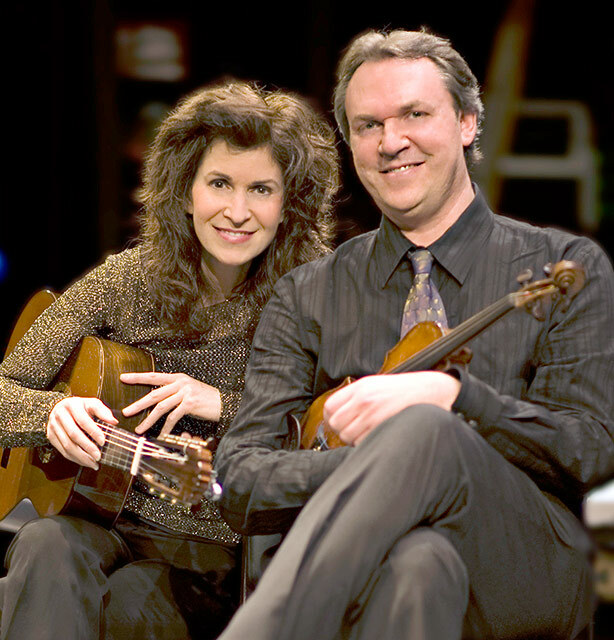 With three-time Grammy winning classical guitarist Sharon Isbin, O’Connor assays his “Appalachia Waltz,” the title of his 1996 album-length collaboration with Yo-Yo Ma and Edgar Meyer. This guitar and violin version, reflective and sweet all at once, features the two friends in a quiet, nuanced dialogue, a proper contemplative note at album’s end. Purists may indeed agree with an Amazon reviewer who can’t spell Appalachia but decries this as being Appalachian in stock cover photo only; but even taking such objections into account, what’s right here is the spirit invested by some of today’s finest musical artists in lending virtuosity, heart and soul to these proceedings. Merry Christmas to all, and to all a good night.